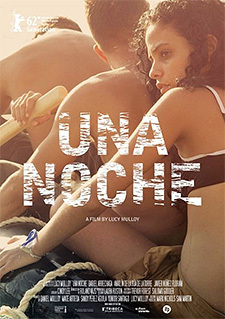 Filmed in cinéma véritée fashion, “Una Noche” is a movie about that nervous desperation. It’s about three young people in Havana bouncing here and there, scrimping this and that. Do they have a plan? We assume so. We’ve seen the movie poster. We know what the movie’s about, more or less. But the plan has no center. But mostly it’s about 90 miles. That’s the distance from Cuba to Miami, from poverty to wealth, from communism to capitalism. It’s the distance to a different kind of desperation. Lila and Elio are twins—she’s eight minutes older—who have always communicated well, who can almost finish each other’s thoughts. Lately, though, Elio’s grown distant, and Lila follows him around to find out why. She follows their father, too, a military man, and discovers he’s having an affair. She’s teased by other girls for the hair on her arms, and wonders whether she should pluck her eyebrows. She holds off the boys but dreams of first kisses. Despite all this, we don’t really get to know her, and what we do know isn’t that interesting. She’s most interesting in voiceover. All of them are. We don’t really get to know Elio, either. Lila thinks he has a girl but he has a boy. Except the boy, Raul, doesn’t know it. Of the three, Elio is the most serious. He’s not following after other people’s drams, as Lila, nor sabotaging his own, as Raul, but moving forward. He’s doing it all for love. That’s an answer to this question: What kind of desperation makes someone get on a small raft and paddle 90 miles across shark-infested waters? It’s not just the beacon on the other side. You need a push. Raul is pushed by a mistake. There are two classes of people in Havana, citizens and tourists, and he’s seen talking to a tourist, and that tourist—or her father?—winds up in the hospital, so Raul is suspected since no one else is. “In Havana,” Lila says in voiceover, “only a fool runs from the police.” Raul is that fool. And that’s his final push. Elio is then pushed—or pulled—by his love for Raul. Lila discovers their plans and can’t abide Havana without her brother. That’s how all three wind up on this small raft, paddling. One hopes, away from the bustle of the city, that things will calm down and the three will get serious. Instead, on the small raft, their stupidity has nowhere to hide. Raul complains about paddling. He asks for a backrub from Lila, flirts with Lila, tries to kiss Lila. Elio kisses Raul. They fight. Then the shark comes. By then, I’d lost interest. The characters were too stupid, too spoiled, to care about. I gained some sympathy back again when Lila and Raul finally float, exhausted, to land, and are greeted by white jet skiers. For a second, we think: Miami. But wait, doesn’t the blonde-haired girl look familiar? Isn’t she the one Raul was talking to earlier? Indeed. One of the jet skiers, a tourist boy, leans forward and says, “Are you trying to get to Miami?” and flashes a big grin to his friends. It’s a joke to them, these boat people, trying to get to Miami but winding back in Havana. It’s a kind of horror for us. Elio doesn’t make it. “Una Noche” is at its best when it gives us flashes of the hectic life in Havana, a city that time forgot, where 1950s cars coexist with knockoff smartphones. (They’ve improved the catcalls anyway. One guy, to a hot girl passing: “I’ll wash, iron and cook for you daily!”) It’s a trapped city and these three try to break free of it. They’re young and pretty, and, like the young and pretty everywhere, just not that interesting.